Clearly the beautiful picture of North caught in a quieter moment is a special one to the rapper for him to decide to share it. The stunning image shows the three-year-old in a bath covered to her head in water and surrounded by glow sticks as she stares past the camera. Kanye posted the image alongside a throwback from his high school yearbook in 1995. “This will make the world better,” he wrote. Ocean dropped his highly anticipated album on Sunday after a four-year wait. “Radio has to support amazing artists,” West said. He also referred to himself and Drake — both fans of Ocean’s, both of whom receive their fair share of airtime. This entry was posted in TV+ShoBiz and tagged Cover Up! 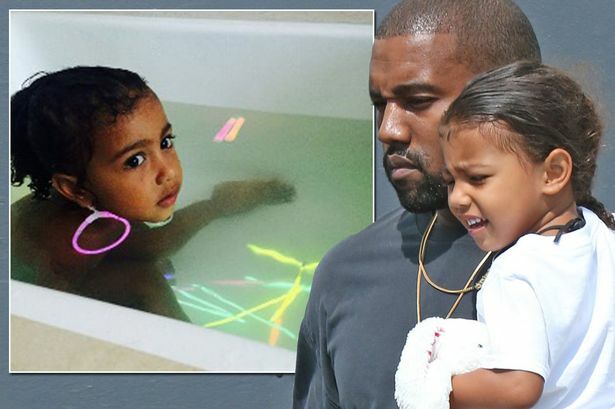 Kanye West SLAMS Kim For X-Rated Mexico Bikini Shoots, Frank Ocean - At Your Best / You Are Love (Endless / Boys Don't Cry Album), Kanye West shares rare picture of daughter North surrounded by glow sticks, Kanye West Wants ‘Every Station Across the Globe’ to Play Frank Ocean, Kanye West's Reality-TV Reckoning. Bookmark the permalink.